A new update is now available sporting a better look-and-feel and upgraded Camper Mode / Cabin Temperature Protection services. With this release comes a renovated UI following material design practices more closely. This is only the 1st part of the makeover as I am currently in the process of renovating the graphical assets themselves as we speak and I'll have that complete in the next release. A much needed upgrade, Camper Mode and Cabin Temperature Protection services are now one and the same combining the best features of both. Built from the ground up, you can now expect better functionality and increased reliability alongside new configuration options allowing you to have even more control over your HVAC remotely. 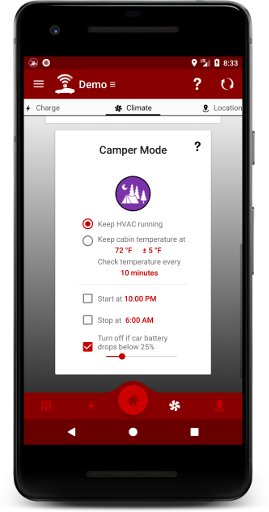 Both Camper Mode and Cabin Temperature protection share the same options for setting a start and end time, as well as a battery protection setting so the service automatically stops when the battery drops below the set percentage. Both of these services also will only ever send a command if the vehicle is parked, if the vehicle is in gear it is assumed you can control the HVAC yourself. So you can leave them running and drive away without your HVAC turning off on its own or your temperatures being adjusted, etc. If you wish to use Camper Mode, you can set it to keep the HVAC running and every 15 minutes the service will send a command to start the HVAC. If you are confused what the differences are, think of Cabin Temperature Protection as a smarter version of Camper Mode where the HVAC is turned on and off as needed versus Camper Mode which simply keeps it on. If you wish to use Cabin Temperature Protection, you can set it to keep your cabin temperature at a certain temperature +/- a temperature range and every time interval the service will check in on your vehicle's cabin temperature and assess whether it should start or stop the HVAC, or adjust the set temperature to your target temperature in order to get the cabin temperature back down within your range. Cabin temperature protection requires a cabin temperature reading from the car to function, this means the temperature sensors must be online. When the car sleeps, its temperature sensors may go offline, as such the HVAC must be started briefly in order to wake them up. This pilot start/stop of the HVAC is automatic and will only ever occur when needed, and only runs the HVAC for 1 minute giving the sensors ample time to provide an accurate reading. With this new Cabin Temperature Protection, you have a few more options. Requires HVAC stopping option enabled as this functionality works by stopping the HVAC once it's within your temperature range as it's cooling down or heating up on its way to your target temperature. The lower this interval, the more often the service will run resulting in less cabin temperature fluctuations as temperatures raise and lower as the HVAC turns on and off. This comes at the cost of some battery life on your device as it wakes up more frequently to check in on your vehicle's temperature. With HVAC stopping enabled, the service will now throttle the HVAC on and off with commands as needed in order to get the cabin temperature back in range once it's outside. The downside to this is a Stop HVAC command acts as if you turned the HVAC off in the car, so when you leave your vehicle with the HVAC on then return later you may find the HVAC is now off and requires you to start it again. With HVAC stopping disabled, a Stop HVAC command is never sent so instead the service will let the HVAC naturally turns itself off after 30 minutes thus preserving the HVAC-on state your car had when you left it so when you return to your vehicle, it automatically turns on. I'll be out of town June 3rd to June 10th without internet starting this Saturday (tomorrow). This means I won't be able to respond to any of your guys' questions or issues, I ask for your patience and I'll be sure to comb over everything and respond ASAP after June 10th. To enter an access code, press-and-hold the sign-in button for 3 seconds. Thanks everyone for your support, keep the feedback and great ideas coming. I got a lot more coming up so stay tuned. How does this app connect to the car, which adapter is used? Can I delete errors (DTC)? 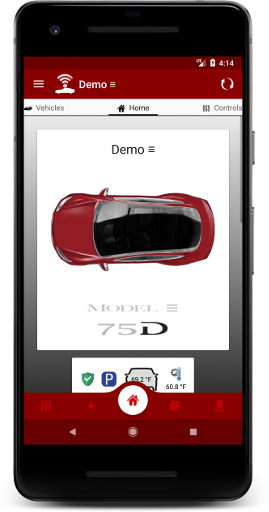 e.mechanic, this app is a replacement for the official Tesla app, it communicates with Tesla vehicles remotely using Tesla's APIs hosted by them. This app does not interface with the car through a physical connection in anyway, as such there is no physical adapter. As I understand the ability to do this is proprietary, private to Tesla technicians only, however I could certainly be wrong. I came to your website thinking I could answer my own question, but no luck. I know I have adjusted the amount of charge my car is to receive at my smart charging location (I love the feature), but for the life of me I can't figure it out again. How do I change the % charge the car will receive during a smart charging session? Thanks for the great app. and your support. Well, I bought this app for 2 features ...Smart charging and plug in warning ...I can't get either to work .. Further , most of the time my phone shows "No internet connection " ...The car is connected to the cell towers all the time , RIGHT......So , whats the problem here ... My Tesla app shows connection and I have no problem setting temps etc ..Also Alexa has no problem setting the temp . Hmmm !! $26 bucks for this ... Also , I don't need a sign out page .When I back arrow the app it backgrounds ..That's enough .. I would love to have the 2 apps above (working ) Keep working on this , Please . Sorry for the inconvenience, let's try to resolve those. For starters, per your request I just added a new setting to the app that lets you change the behavior of the back button from either prompting if you want to sign out or closing the app. It will be included in the next app update that will be available later this evening. For your issue with the no internet connection being reported by smart charging and the plug-in reminder, there was a bug in an older version of the app that would cause plug-in reminder or smart charging to think the device did not have a usable internet connection even when it did. This has been fixed, make sure you've updated to the latest version of the app and try again. If you are notified about Battery Warning optimizations, be sure to disable battery optimizations for the "Dashboard for Tesla" app in the Android settings because failure to do so will prevent background services from working properly when the device sleeps - this impacts smart charging, plug-in reminder, automatic behaviors, etc. FYI This app is now crashing on me every time I open it and connect to my car. I was just updated to Tesla Firmware version 46.8 which appears to have changed the schema of some of the vehicle properties a bit (some of my own API scripts stopped working after the update). Crash occurs on all my Android devices (Galaxy Tab S3, Note 8, etc). Byshop303 , thanks for the report. On Monday, November 20th, Tesla began rolling out a new vehicle firmware with a breaking change in how data was being served that rendered the Dashboard for Tesla app unusable on vehicles running this newer firmware. This issue has been resolved and steps have been taken to help mitigate and prevent this type of issue from happening again in the future. To restore functionality, update the app by visiting the Dashboard for Tesla Play Store listing. Sorry for any inconvenience this may have caused, and thank you for your support and patience. You must log in to post a reply.